Am I better off replacing my old aluminium windows or getting Window Revival to restore them? Whenever I do an onsite visit I give a replacement recommendation about 20% of the time and a restoration/painting recommendation the other 80%, because Window Revival’s window restoration process provides the best value. You no longer have to replace your windows because they’re old and don’t work properly or because you don’t like the colour. You see, we have and CAN restore old and difficult to open windows. The most important factor in determining whether to replace or restore should be the number of finished surfaces surrounding your windows- you don’t want those damaged by ripping your windows out. 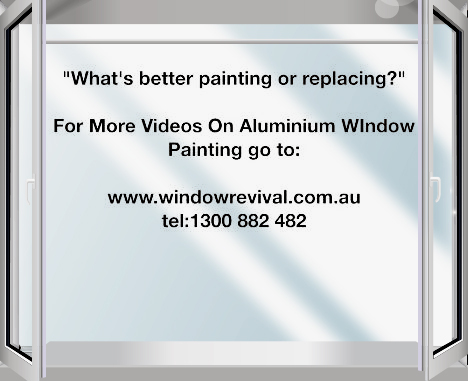 It’s the repair cost to damaged surfaces surrounding ripped out windows that can add tens of thousands of dollars to the replacement cost, making aluminium window restoration the best value solution. If you’ve just finished renovating then decide you don’t like the colour of windows, then the cost of replacement and repair to all the adjacent finished surfaces is going to make the painting cost ridiculously inexpensive in comparison. There are lots of reasons why you wouldn’t want to replace windows if you just wanted a colour change – the hassle of windows being trapped between double brick work, windows that have been plastered or tiled in, windows sandwiched between timber weather boards, the list goes on.